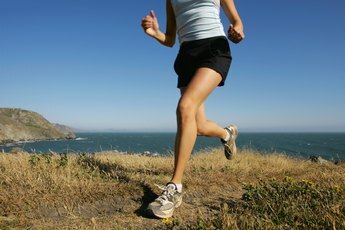 Turn yourself into a calorie-burning machine by jogging. Burning calories seems pretty straightforward: Exercise as much as possible to burn as many calories as possible. Yes, this may help you lose weight and tighten up your body, but it’s potentially dangerous as well. It could put too much stress on your cardiovascular system, muscles and joints. A report published by the American Heart Association states 600 to 1,200 calories burned per week is “enough.” As your fitness level progresses, ramp up the intensity or length or both of each workout to burn even more calories. The key is knowing how much exercise your body can handle. First things first: You must know how long to work out. The Centers for Disease Control and Prevention (CDC) suggests adults get a minimum of 150 minutes of moderately intense exercise per week, or the equivalent of five 30-minute workouts. This would include exercises like walking briskly or cycling at a leisurely pace. The key point to make about workout duration is that the CDC doesn’t specify a maximum exercise limit per workout. It all depends upon your physical fitness level -- more on that later. What’s your purpose for working out? Resistance training builds strength and muscle tone, but this type of workout burns fewer calories than aerobic exercise does. If your goal is to tighten and tone your body with resistance training, don’t focus too much on how many calories you’re burning. On the other hand, if you’re looking to burn fat and lose weight, the number of calories you burn becomes a bit more important to monitor. A 160-pound adult burns 365 calories per hour lifting weights, according to MayoClinic.com. The same person burns 606 calories per hour jogging at a moderate 5 mph pace. So, you can see how aerobic exercise is superior to resistance training when it comes to burning calories. The more you increase the intensity during a workout, the greater the calorie burn. For instance, increasing your jogging speed to a more vigorous 8 mph boosts the calories burned per hour to 861. A brisk 60-minute walk burns 314 calories per hour, so it’s a great way to reduce impact on your joints yet still get an effective workout. Burning too many calories during a single workout can put excessive strain on your heart, joints and muscles. The general CDC recommendation of 30 minutes of moderate exercise per day is safe for adults of nearly any fitness level. However, you can increase the intensity and duration of your workouts if your physical fitness level allows. The safe rate of weight loss specified by the CDC is up to 2 pounds per week, which is equivalent to 7,000 calories per week or 1,000 calories per day. You can cut more than half these calories by eating healthier and avoiding sugary drinks and snacks. Burn the other 300 to 500 calories with exercise to get you at the 1,000-calorie per day level. These are just general guidelines for burning calories; be sure to consult your doctor to see if you’re physically fit to ramp up the workout intensity level and calorie burn.